There are few details on the kids, but they’re believed to be between the ages of 10 months and 7 years old. Though the North Korean leader will be meeting with President Donald Trump for a summit in Hanoi this week – following their historic meeting in Singapore last year – he remains an object of wild speculation and curiosity throughout much of the western world. Most of the currently available information about the family comes from South Korea’s National Intelligence Service. But former US basketball star Dennis Rodman has also spoken to media about holding one of Kim’s children during one of his controversial visits to the Hermit Kingdom, though the details he provided have not been independently corroborated. Kim’s first child is believed to be a boy, born in 2010, and his second child was likely a daughter born in 2013. The fact that Kim has at least one male heir likely means that he would eventually succeed Kim to continue the family’s dictatorship dynasty. But the gender of Kim’s third child, remains unknown. The child is believed to have been born in February 2017. Kim’s daughter is named Ju Ae, according to Dennis Rodman, who said he met the child in 2013. “I held their baby Ju Ae and spoke with Ms. Ri as well. [Kim’s] a good dad and has a beautiful family,” Rodman told The Guardian. The kids’ exact ages and birth years have been difficult to pin down, but can be roughly inferred from the lengthy periods in which Ri has mysteriously vanished from public life. In late 2016, media outlets began noticing that Ri had not been seen for roughly seven months, sparking fears that she had perhaps fallen out of favour with Kim. There are no public photos of Kim and Ri’s children, but the couple do occasionally pose for propaganda photos with other people’s kids, like in this photo at a children’s hospital in 2014. Or this photo at a children’s camp in 2013. The youth of Kim’s children was speculated to be one of the reasons Kim promoted his sister in October 2017 to a top position in his government: the head of the propaganda department of the Worker’s Party of Korea. Though Kim Yo Jong is often seen by her brother’s side and is the most powerful woman in North Korea, her high-ranking position doesn’t mean indefinite protection. Kim is known to turn on family members quickly when they fall out of favour. It’s widely suspected that he orchestrated the plot to murder his half-brother Kim Jong Nam in 2017. The secrecy around Kim’s children is not unusual for his family — there are still contested claims over the number of children and wives Kim’s father and grandfather had. 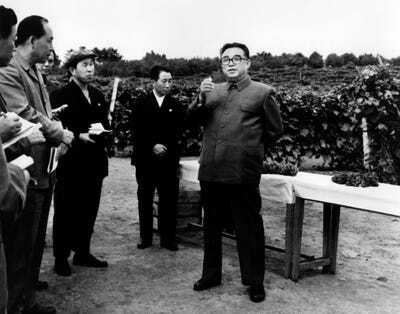 KCNA via Associated PressKim Il Sung visits a fruit farm in North Hwanghae, North Korea in 1979. Here’s Kim Jong Un’s full family tree, with his three likely heirs on the bottom right. 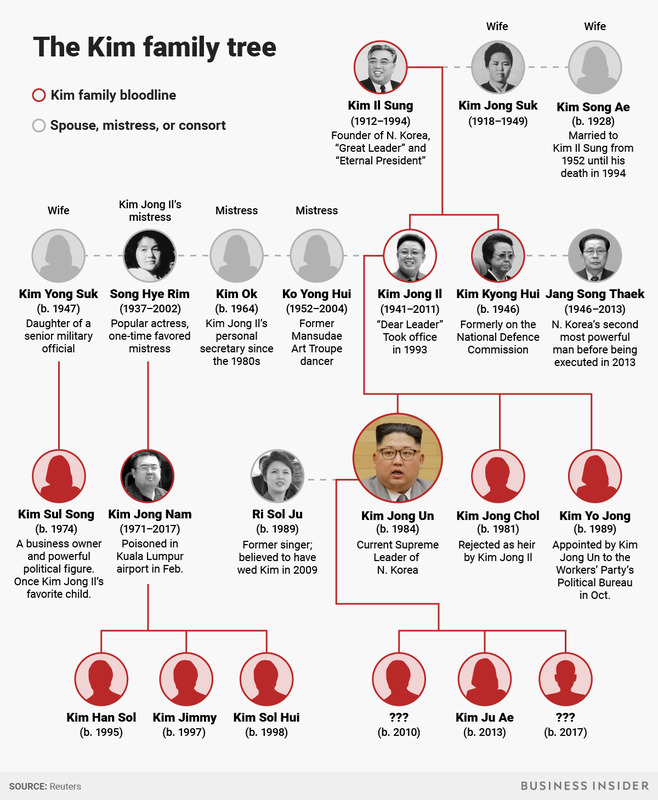 Business Insider/Samantha LeeThe Kim family tree.